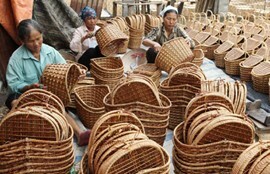 Vietnam, one of the finest handicraft producers in the world, has had a long development history. In recent years, Vietnamese handicraft products have been developing remarkably. According to the Ministry of Industry and Trade, the export value climbed from about US$2,065 million in 2010 to an estimated US$2,541 million in 2017. Vietnam's fine-art handicrafts are now available in 163 countries and territories around the world. Handicrafts made from bamboo, rattan, lacquer and silk are highly appreciated by consumers. This industry creates 1.5 million jobs in more than 2,000 handicraft villages across the country. Most handicraft villages in Vietnam mainly have two production models: Making products as specified by customers or creating traditionally styled items. Either way, Artisans’ creativity must base on customer tastes. Vietnamese handicraft companies mainly engage in early stages in handicraft value chains and added value primarily belongs to downstream distributors. A majority of handicrafts are made by households, except for some highly sophisticated items that require advanced technology, modern machinery and some foreign materials. However, the handicraft sector in Vietnam is facing numerous structural obstacles such as weak production capacity, ineffective support systems, poor design and little progress in product creativity and small product output. Although Vietnam exports its handicrafts to most countries and regions in the world, three biggest export markets are the United States (34 per cent), Japan (11 per cent) and the EU (Germany: 8 per cent, France: 5 per cent, etc.) The potential of these three markets is huge because Vietnam accounts for a tiny share in their import values. Currently, Vietnam accounts for 1.5 per cent in the US, 1.7 per cent in Japan and 5.4 per cent in EU. Recently, the Vietnam Trade Promotion Agency (Vietrade) under the Ministry of Industry and Trade introduced some solutions and notes in penetrating these three target handicraft markets. For the US market, enterprises should seek individual distribution channels because customers always look for something really special to attract more buyers in the market. They need to improve designs and product functions. The Japanese market has strict requirements for quality products, especially safety and utility, while culture and aesthetics are always highly demanding. Particularly, for Japanese consumers, being cheaper in price means being worse in quality and they are thus willing to pay higher for better products. For the European Union, export services (delivery schedule, category, quality pledge, logistics, etc.) are more important than quality and price of products. Producers also need to pay special attention to standards of social responsibility and environmental protection in exporting to the EU. The individuality of a product is always a good competitive edge. Having good knowledge of consumer tastes, especially of foreign customers, requires a great deal of effort and money. Thus, they should selectively attend prestigious fairs and exhibitions and explore tastes of foreign customers right in Vietnam, without having to go abroad to do this. They can go to popular tourist attractions in Hanoi, Sa Pa, Da Nang, Hoi An, Hue and Ho Chi Minh City to see how foreigners buy products. They should actively introduce and market products via the internet and focus on featuring product values and benefits like cultural values and traditional quintessence in each product instead of just introducing the shape, size and materials of fine-art handicraft.